The Ontario Health Coalition works to improve the public health system: to save local health care services, stop cuts and privatization and keep our community hospitals vibrant. We believe compassion should come before profit and all should have equal access to care based on need, not wealth. We work to ensure that these values which underlie Public Medicare in Canada are protected and strengthened. By ordering garlic with us, you are supporting this vital work. 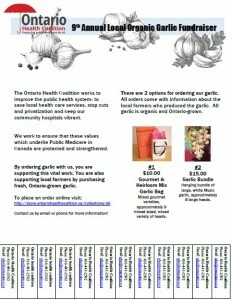 You are also supporting local farmers by purchasing fresh, Ontario-grown garlic. Please distribute this form in your office or among your friends and family. Please fill out the attached order sheet and submit orders with cash and cheque. Deadline: We must receive your order by July 31. Orders will only be made if the garlic is paid for. NOTE: We deliver to individuals, organizations, or workplaces that submit an order with at least three ordered items, and only within the GTA. Delivery is free. Shipping by mails is $3.00 per unit ordered. We will also drop-off garlic orders to local coalitions in September in Ottawa, Oshawa, Kingston, London, Windsor, Sarnia-Lambton, Chatham-Kent, and North Bay. You can pick-up your garlic in these towns at the first coalition meeting in September to save on shipping costs. There are 2 options for ordering our garlic. All orders come with information about the local farmers who produced the garlic. Allgarlic is organic and Ontario-grown. Mixed gourmet varieties, approximately 9 mixed sized, mixed variety of heads. Hanging bundle of large, white Music garlic, approximately 8 large heads. NOTE: We receive the garlic in August when it has been picked and has had time to dry – timing varies according to the weather. Our volunteers bag and bundle the garlic and we usually have them ready to go out to be delivered by Labour Day weekend.